Most of the finer productions in stained and mosaic glass used in this country were imported from Europe, principally from Munich and other cities in Bavaria. Of late years, however, notable progress has been made in this branch of art in the United States, until a high degree of excellence has been reached. Ludwig Grosse is remembered, if at all, for bringing William Willet to Pittsburgh in 1897; Willet served as art director of Grosse’s firm 1897-98, before establishing his own studio here in 1899. While researching Willet’s career, Joan Gaul found that Ludwig Grosse was born in 1862 in Munich, Germany, attended the Munich Academy, arrived in Pittsburgh in 1888, and died in 1917. An 1894 description of Grosse’s firm in a commercial directory and listings and advertisements in city directories give us glimpses of Grosse’s activities in Pittsburgh. 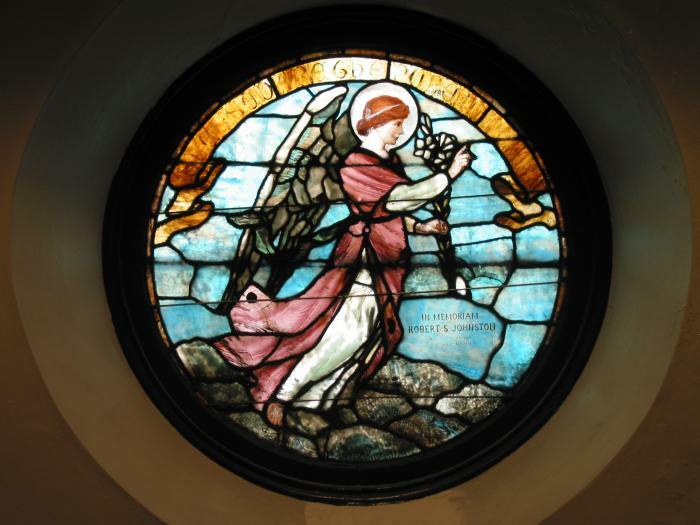 He established himself as “an artist in stained glass” in 1889, worked for the prominent Pittsburgh glass firm of S. S. Marshall & Brothers in 1890, acquired their downtown facility and opened The L. Grosse Art Glass Company there in 1891; the company continued under his name through 1898. In 1899 and 1900 he is listed as a dealer in “art works.” Grosse appears to have left Pittsburgh thereafter. The dedicatory services of the Protestant Episcopal Church of the Good Shepherd, Hazelwood . . . will take place tomorrow morning . . . . The inside is beautifully frescoed and the windows, made from designs by Mr. Ludwig Grosse, of this city, are both handsome and artistic. One of them is the gift of Mrs. Simon Johnston in memory of her son whose death occurred less than a year ago. Ludwig Grosse was trained in Munich, a center for the production of stained glass and religious decorative art, supported by Ludwig I and shaped aesthetically by an association of German artists, The Brotherhood of St. Luke. These artists, also known as “the Nazarenes,” were inspired by early Renaissance portraiture. Sarah Brown writes in Stained Glass (1992): “The work of the Nazarenes was characterized by a religious idealism combined with a style derived from that of Dürer, Raphael, and Perugino.” When Grosse arrived in Pittsburgh in 1888, he found a kindred artistic environment. Although American glass artists were using a new material—opalescent window glass, invented by American painter John La Farge, that was made by blending opaline (milk glass) with molten colored glasses—and not the traditional hand-blown antique glass used elsewhere, the prevailing aesthetic in the United States favored glass windows imbued with the idealized naturalism found in Renaissance paintings. 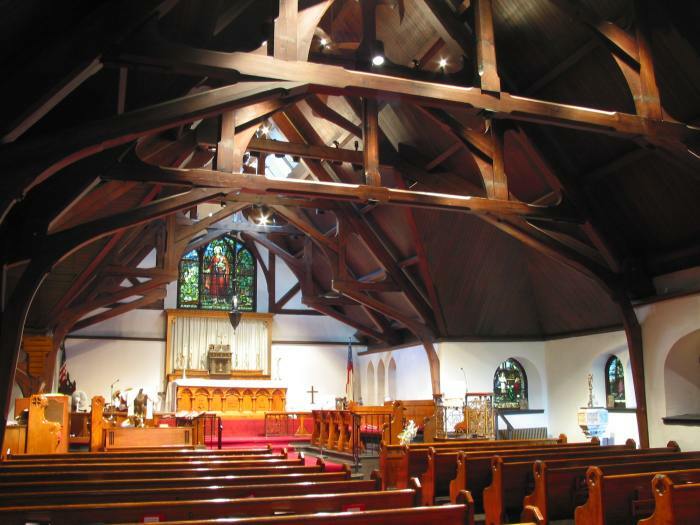 The Church of the Good Shepherd, Hazelwood (1891-92), ranks among Pittsburgh’s most significant church buildings. It is the second of three buildings in metropolitan Pittsburgh designed by William Halsey Wood of Newark, New Jersey (1855-1897), an architect of great promise—Ralph Adams Cram called him “a man of genius”—who died at the age of 41. 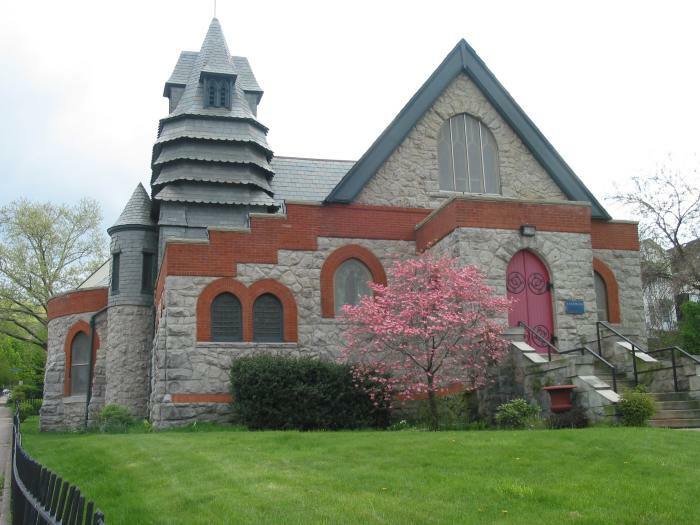 Wood also designed the Carnegie Library in Braddock, 1888; and the Episcopal Church of the Ascension in Pittsburgh, 1896, noteworthy for glass by Healy & Millet of Chicago and furnishings and decoration by J. & R. Lamb Studios of New York. Sources: The Bulletin 25, 29 October 1892: 19. History and Commerce of Pittsburgh and Environs (New York 1894): 83, 219. Pittsburgh city directories 1889-1900. Sarah Brown, Stained Glass: An Illustrated History (London 1992): 134. Joan Gaul, “Pittsburgh 1893-1912: Five Artists,” The Journal of Stained Glass 28 (2004): 49. Thanks to David J. Vater and Sue Weigand of Wheeling, WV, for research assistance.